by Dr. Deny Sentosa, Ph.D | Hey, this is for you! 15 Nov Hey, this is for you! Well well well… who is never in bad mood before? Not me, definitely. Since I started Young Living in Feb 2013, I know about emotional oils but I never explore until mid 2014 and started to use early 2015. I must say, I was surprised with the result. I feel lighter and I can feel the shift in my behavior (towards positive sides, of course!). I become less rigid in doing stuff and as the result, grumpiness leaves me bit by bit. Oh, I am still grumpy on certain days, but it has reduced a lot! And I start to explore more on emotional oils. 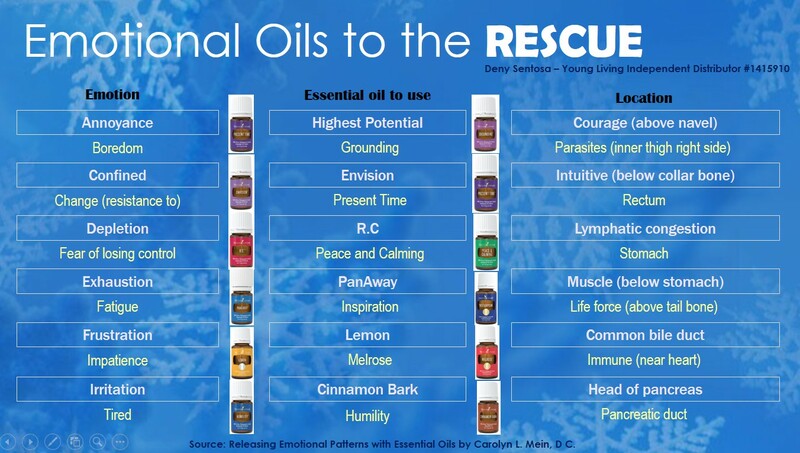 Below are the lists of some oils for some emotions. This graphics is only a minuscule scale on what in store in the book, Releasing Emotional Patterns. The emotions described are what I think I will need, just in case, in the future. I am determined to run towards positive emotions! Are you?